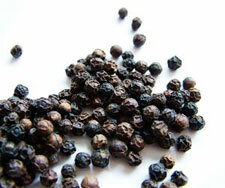 Black Pepper essential oil is used today in perfumery to add a 'kick' to fragrance blends and for thousands of years the herb has been used for both culinary and medicinal purposes by the Chinese, Romans and Greeks. Common Extraction Method: Steam distillation of the dried peppercorns. Plant Origin: Major producers are China, India, Indonesia, Malaysia and Madagascar. Physical Description: Clear to pale green color with a thin consistency. Aromatic Description: Warm, sharp, dry, woody, spicy scent. Properties & Benefits: Has anti-microbial, anti-toxic, anti-spasmodic, anti-septic, aphrodisiac and bactericidal properties. Is reported to increase awareness and memory as well as help with colds, flu, infections, viruses, arthritis and muscular aches and pains. Blends well with: Bergamot, clary sage, clove, fennel, frankincense, geranium, ginger, grapefruit, lavender, juniper, lemon, lemongrass, lime, mandarin, marjoram, myrrh, sweet orange, patchouli, palmarosa, rosemary, sage, sandalwood, tea tree, vetiver, and ylang ylang. Cautions: Possible sensitization to some individuals when used in high concentrations. Do not use during pregnancy.